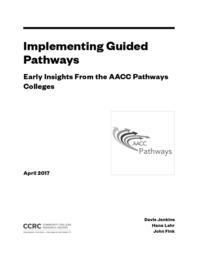 This report provides insight into how colleges are planning and implementing “guided pathways” reforms based on the early work of 30 colleges participating in the American Association of Community Colleges’ (AACC) Pathways Project. These colleges have committed to redesigning their programs and support services for all incoming students by fall 2018 according to the guided pathways model adopted by AACC based on CCRC’s research. 4. ensuring that students are learning. The authors indicate where colleges are taking similar approaches and note novel or innovative strategies, providing examples in each case. They discuss lessons the colleges have learned from their experiences, challenges that they are working to resolve, and strategies they are using to manage the change process. They conclude by examining a key next frontier for pathways colleges: connecting their developmental education reforms to their pathways efforts to better enable students to pass critical program gateway courses and get on a path toward program completion as efficiently as possible.